Eaton Non-illuminated pushbutton operator with momentary action, has a mounting hole diameter of 22.5-mm. 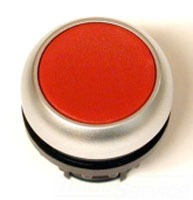 Flush mountable pushbutton operator with red color, has flush button actuator. It offers IP67, IP69K protection and is NEMA 4X, 13 rated. This operator includes contact block mounting adapter. The operator with silver bezel, has an operating cycles of 5000000 mechanical operations. It measures 1.17-Inch x 1.17-Inch x 0.39-Inch. Pushbutton operator meets CSA, CE, CCC, Lloyd's register, GoST-R and Bureau Veritas standards.